Even for the most experienced user, perfectly straight cuts with a circular saw are extremely difficult without the right accessories. Tools Plus carries an extensive line of rip fence guides, saw guides, hangers and other accessories that make using your circular saw an effortless task. Many people settle for less when it comes to making accurate cuts with their saw. 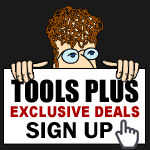 Make sure you don't settle; get a circular saw accessory from Tools Plus. Designed to accommodate Milwaukee Cordless Circular Saw models 0730, 6310, or 6320.